On this page, you will learn how to optimize the rotation of your Havoc Demon Hunter in both single-target and multiple-target situations. We also have advanced sections about cooldowns, procs, etc. in order to minmax your DPS. All our content is updated for World of Warcraft — Battle for Azeroth (BfA) 8.1.5. Havoc's single target rotation hinges strongly on the combination of generation (either through active tools such as Demon's Bite or talents like Demon Blades) and your main spender, Chaos Strike. Past this, depending on talents, other spells enter into the rotation adding depth, making it important to manage both your resource and your other spell cooldowns. Cast Vengeful Retreat to trigger the Momentum Fury gain. Cast Fel Rush if about to hit 2 charges, or to trigger the Momentum buff. Cast Dark Slash when above 80 Fury. Cast Eye Beam on as many targets as possible. Cast Nemesis on your primary target. Cast Metamorphosis if available and not active. Cast Blade Dance / Death Sweep at 3 or above targets. Cast Blade Dance / Death Sweep. Cast Felblade if under 80 Fury. Cast Chaos Strike / Annihilation. Cast Fel Rush with nothing else available. Cast Throw Glaive with nothing else available. Note that Eye Beam returns to the single target rotation in Battle for Azeroth due to the Fury efficiency, guaranteed Critical Strikes and additional damage to your primary targets. However, if there are any prospective situations that will increase the number of targets that can be hit by both this and Fel Barrage before it comes back off cooldown, it is always preferable to hold it to hit additional enemies. When using Felblade, it can be used to quickly get back in range after a Fel Rush cast if the target hitbox is too small to efficiently move across it, so can also be treated as a movement tool if available, but do not hold this in your rotation for extended periods as this is a minor perk. With regards to Fel Rush, it is a very valuable tool to generate damage in the empty global cooldowns created by Demon Blades so long as you can remain within auto attack range. Otherwise using this is generally considered a slight loss, as it wastes global cooldowns that could be spent on generating or spending Fury. Pre-cast Immolation Aura if taken. Use Battle Potion of Agility just before the pull. Cast Felblade to generate burst Fury. Cast Fel Rush with Momentum taken. Cast Death Sweep with First Blood taken. Cast Demon's Bite to reach 30 Fury. Cast Eye Beam to trigger Metamorphosis. Due to Demonic having different interactions with some spells, it warrants a different opener. This utilises your Demonic activations with Eye Beam as soon as possible, alongside the large burst of Fury that comes from Blind Fury. Also note that if you are using a Chaotic Transformation trait, you should ideally be following the Demonic opener, regardless of whether or not you are currently using the talent build. Be aware that using this rotationally for damage to fill your empty Globals with Demon Blades is dependant on how effectively you can maneuver yourself around the boss' hitbox. Its strength is that it has a reduced Global Cooldown timer, but if any of that time is then wasted by you being out of range of the boss and losing uptime will usually result in a net loss. Some bosses have small enough hitboxes that they simply prevent you from using this (though when taking Momentum, as explained later, this does not matter, as you have to use it anyway) and in those cases, you should forego casting it. Something that may be new to players in Battle for Azeroth is the lack of very strict linear builds in the talent tree. Whilst synergies do exist between some related talents (such as Blind Fury + Demonic, or Trail of Ruin + First Blood), there is more room to mix and match talents, so long as you are able to sustain the rotational pace and complexity your choices add. This marks a shift from the strict talent picks from top to bottom, and adds some flexibility. Your decision between Blind Fury and Felblade can be decided both by preference and situation. Demonic Appetite simply does not compare in generation or opportunities to play well around the talent to gain value due to having no direct damage component. Felblade will excel as a single target generator, in particular when paired with Demon Blades to inject another active generation tool, thereby filling the gap left by Demon's Bite. It also has a small extra bonus of being a short distance charge, adding yet more mobility and sticking power into the toolkit. Blind Fury, on the other hand, enhances your Eye Beam cast damage, alongside turning it into a generation tool that will refill your entire bar. Making sure you are as drained as possible before this comes off cooldown is important so as to not waste excess, so being aware of the cooldown and spending as aggressively as possible leading up to this is key. Insatiable Hunger has very little impact on the rotation and is simply the quick and easy choice, but is significantly behind alternatives both in output and versatility. Immolation Aura, on the other hand, has a very strong potential to gain output in a variety of situations. It serves both as a small damage cooldown, an AoE DoT effect, and a short term generation tool all in one package, on a relatively short cooldown. Using this during periods where you would ideally prefer to spend to sustain you, or just as an on cooldown generation tool both work, and it is a very flexible tool to have available. Demon Blades slows down your pace by removing your active generation tool Demon's Bite, and replacing it with a 60% chance proc from auto attacks to deal additional Shadow damage and grant 12-20 Fury. This adds an element of reactionary play as you will no longer be Global Cooldown locked, instead opting to wait for your Fury to passively generate from auto attacks. This makes the playstyle more chaotic in practice compared to the alternatives, and during high Haste periods demands some quick chains of Chaos Strike casts to burn off Fury, whilst being patient if procs are not happening. Cycle of Hatred appears to be a very niche pick, mostly operating as a way to potentially bring Metamorphosis cooldown closer to certain fight breakpoints if necessary. This will likely always remain a pick that will require foresight to know whether or not it is beneficial, and also by extension a fringe selection. First Blood adding a cheap spender in Blade Dance is great for having something that is flexible without requiring a large amount of Fury to capitalise upon. It also serves well as a high front loaded opener of damage during burst windows such as Momentum without committing too much Fury and potentially draining yourself. It is extremely important to be aware of when you are intending to initiate a burst window, however, ensuring that you have Blade Dance ready to go immediately, rather than having to wait. You also still need to make sure you keep the ability on cooldown as efficiently as possible due to its high Fury efficiency, so may require some practice predicting and juggling the cooldown. Dark Slash currently struggles numerically, but like many other things in the toolkit, provides a small window of additional burst damage that can potentially be lined up with effects such as Demonic. This will naturally line up with some effects, whilst others it may desync occasionally; but uptime is key and keeping this on cooldown is vital. The only real limitation is you must be casting this with a bank of Fury available already to instantly capitalise on the Chaos Strike boost it grants. This tier is very much a contentious point amongst players as they all have their uses, so here I will try to explain as succinctly as possible the situation between Momentum and Nemesis. Demonic is a little behind in Battle for Azeroth, but I will still cover the nuances of play with it. Demonic is, like Momentum alongside it on the tier, a damage boost window effect. It will naturally be triggered by your Eye Beam casts rotationally, and will usually be paired with Blind Fury, making sure that whenever you do enter into this window you will do so with a full bar of Fury. Making sure to fill as many Global Cooldowns during the 8 seconds as possible with Fury spenders is crucial, and with the additional Haste, this can sometimes be a stretch to have enough available. Pairing this with Immolation Aura or Demon Blades to allow for background generation instead of committal generation tools such as Demon's Bite can be useful to make the most out of this period, but, in some cases, you will simply have to use active generation due to resource exhaustion caused by RNG. This talent is a very high skill cap option and as such if you are not comfortable with Demon Hunter and raid mechanics in general, it will be very punishing. Knowing when to use your charges, and when to bank them to use both in conjunction for the buff and to avoid mechanics or stay on targets at the same time is a skill that needs to be practiced. Below is an image to show the optimal paths to use your activation skills to stay on target and minimise possible displacement that can have a large knock-on effect. Vengeful Retreat on a 20-second cooldown that generates 80 Fury over 10 seconds when it damages an enemy. There are some fundamental rules when using Momentum to bear in mind during combat. First, the spells that activate Momentum do benefit from the buff they trigger (meaning a Fel Rush cast is boosted even if it is not already active on you when it is cast). You should aim to never clip a Momentum window, and instead aim for maximum uptime. Note that unlike in Legion, additional casts while the buff is active will add to the duration, instead of overwriting it, meaning that two back to back Fel Rush casts will generate a total of 12 seconds of uptime. However, whilst this serves as a way to minimise your waste, you should still ideally attempt to spread your windows out to make sure you are spending as few Global Cooldowns as possible on generation during the 6-second period it is active. Making sure that you have a healthy Fury pool of 80-120 whenever possible when you trigger a window will give the largest amount of room to let you fill all of the buff period with expenditure Global Cooldowns. Any abilities or effects that passively generate Fury that can be triggered before entering into a Fel Rush, such as Immolation Aura or Vengeful Retreat can ideally be cast just before triggering the damage boost, to give extra Fury to play with. Lastly, when using Demon Blades this can make the windows more volatile due to the lower control over your rotation. This will however also mean it is more likely to passively generate enough Fury throughout the buff to sustain your rotation while it is active, so these talents often work well together. You just need to make even more sure that you do not pull yourself too far out of auto attack range when using movement abilities, so as not to waste Demon Blades triggers. If you have taken Nemesis as your 110 talent, try to sync this up with your Metamorphosis whenever possible. Also, try to make sure that you will have high uptime on the target you intend to cast it on to take advantage of as much of the full minute duration as possible. Finally, be wary of casting it on a target that may die that does not share the same creature type as others in the encounter. This will cause you to be unable to make use of the redundancy buff it triggers on different types that remain alive. If taken in AoE situations and all enemies share a creature type, then trying to apply this to a low health target just before it dies will allow you to make use of the buff to deal additional damage to all targets instead of just one. This is important to make use of if the encounter allows for it. Fel Barrage operates in a simpler way in Battle for Azeroth, serving as a 1-minute cooldown burst AoE tool that must be channeled for 3 seconds. Note that while this is channeling, you cannot cast any other abilities during the cast or it will cancel early. This is your best tool for quick damage in AoE situations and should be timed with the highest number of targets nearby. It should also, if taken, be synced up with Momentum damage buffs from Fel Rush. If there is no prospective AoE coming up in an encounter before the cooldown would refresh, then casting this on cooldown will still be a net gain due to its high base damage. it is important to know that Fel Rush can still be used in the Single Target rotation when not needed for movement due to its high damage per cast, especially if using Fel Mastery. Knowing when you need to move in a fight and saving charges preemptively will net far more DPS by virtue of sticking to your target than the additional damage from using it on cooldown. This extends similarly to Vengeful Retreat with Momentum, but this takes more planning as it has no charge system to allow banking for future use. 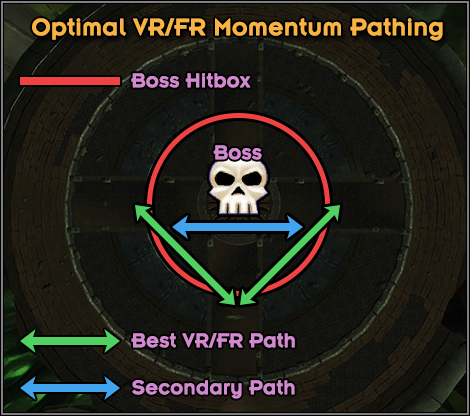 Note as well, if you struggle to stay on a target with a small hitbox when using either of these skills offensively, if Felblade is taken and available, this can quickly move you back to the target efficiently whilst generating Fury in the process to power your Momentum windows. Metamorphosis is a powerful 30-second duration buff on a 4-minute cooldown, with a flat 25% increase to Haste allowing for more ability uses while active. Pooling 100 Fury or above before entering Metamorphosis is extremely beneficial to allow for a surge of Annihilation casts, and draining excess Fury in the last 5 seconds of the buff will lead to the most efficient conversion of resource into damage during this period. Using Eye Beam is either used on cooldown in single target situations assuming you can safely channel for the full duration, or at pressure points in a fight where a large stack of enemies will be available for burst AoE. If there are no situations within the cooldown timer that you would be able to take advantage of additional enemy spawns to maximise the target count, then using it on cooldown in general circumstances is preferable. One of the unique features of Havoc is that it can leverage its movement tools in Fel Rush and Vengeful Retreat to increase your damage output and Fury generation with certain talents. Managing this is important if these have been selected, and knowing whether it is safe to use them based on encounter types is especially important. You can maneuver with Vengeful Retreat in one of two different ways. The first of these is a wall that you can consistently leap back into so that the displacement effect is muted and you remain in melee range of your target. Alternatively, the more consistent option is rotating your character before casting 90 degrees, so that you will move across the back of the target's hitbox, and remain in range upon landing against any reasonably sized target. Do note that at all times, this spell will vault you backwards, so you need to be aware of that when casting. Fel Rush in much the same way requires a similar awareness of your environment to capitalise upon. Instead of focusing on moving backward, however, you need to face the direction you want to rush and then turn back to your target when you arrive. Also, note that both of these spells incur a 1-second movement cooldown to prevent you using them to cancel each other's displacement effect out with animation canceling, and as such you need to treat each cast individually and prepare for the movement to minimize the downsides. With Havoc being so reliant on its resource, you need to be very aware of situations that encourage spending vs. the requirement to build. Depending on talents outlined above, that may be more or less active, and so you need to be planning around those. The general rule is you never want to go into the range of wasting Fury due to going over the cap with a generator cast. This means the spend breakpoint is 90 Fury without talents, due to Demon's Bite having a potential maximum of 30 per cast. With Demon Blades this is more flexible, but given how fast multiple procs can happen, it is preferable to be spending more aggressively when not pooling for burst windows. Also be aware to adjust your rotation based on refunds from your Chaos Strike casts that refund 20 Fury due to the unexpected additional resources in your pool. In the same vein, successful interrupts through Disrupt and dispels using Consume Magic that grant 30 and 20 Fury respectively can also provide extra resources that you may need to spend aggressively to make use of. Cast Chaos Strike/ Annihilation as frequently as possible unless pooling for burst windows. Cast Felblade as frequently as possible, as long as you are below 80 Fury, as your active generation tool. Drain all Fury leading up to your Eye Beam cooldown if using Blind Fury, giving it room to refill your resource bar. Wait and allow Demon Blades to generate Fury again to continue the cycle. Cast Throw Glaive and Fel Rush if out of range of any targets, or in empty Globals. It is optimal to always attempt to initiate a Momentum window before you begin dumping your Fury into Chaos Strike in this way, but as it is now very predictable how much Fury intake you have, you can generally anticipate one to two Global Cooldowns before you predict this to happen and look to initiate the window. 11 Dec. 2018: Small extra note regarding opener with Chaotic Transformation. 12 Sep. 2018: Updated opener to indicate pre-casting Immolation Aura.